How long do washing machines take? How long is a piece of string? 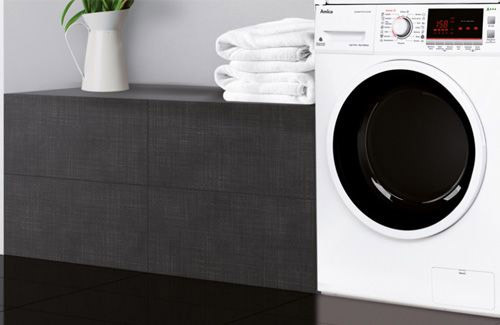 Our shortest quick wash cycle is just 12 minutes long. 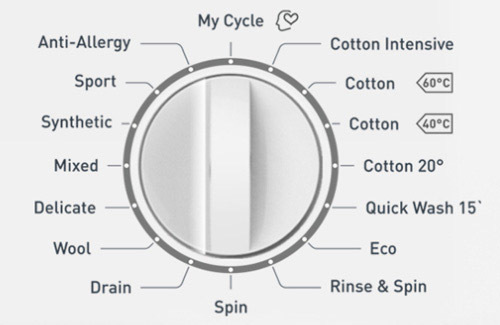 A full, hot cotton cycle might take up to 2 hours if you include the prewash and full spin cycles. It depends on what you are washing, how quickly you need your washing load done and how soiled the items are of course. You will find the length of all the programmes available in your instruction manual. How much do washing machines weigh? On average, a washing machine unwrapped from its packaging weighs between 50 and 60kg. We wouldn’t recommend that you move or lift one alone so make sure you arrange suitable and safe delivery to your kitchen, or have a lifting buddy to come over and help share the load. 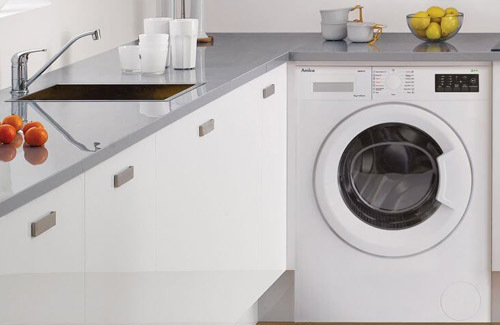 How are washing machines energy efficient? Washing machines can be measured to be energy efficient by the amount of water and electricity that they use. The less they consume, the higher the efficiency rating they will receive. Which washing machines are hot and cold fill? All Amica washing machines are cold fill. This means that you only need to connect them to the cold water supply in your home and let the appliance take care of the heating up of the water for the appropriate wash temperature. Will the washing machine start without water? No, the programme will not run without water, unless you are just running a spin or pump & drain cycle on its own. If there is a problem with the water inlet or water supply, you will see an error code on the screen. Please telephone our technical support team on 01949 862012 to diagnose the problem. Which washing machine cleaner is the best? The choice of cleaners on the shelves in your local supermarket can be overwhelming. Many of them do contain harsh chemicals though and this should be considered if you are looking to control what is expelled in your waste water. Mix together ¼ cup of bicarbonate of soda with the same amount of water in a bowl. Add this mixture to your detergent drawer and pour 2 cups of white vinegar into the drum of your empty machine. Select a hot wash programme, like a 60° or 90° cotton wash. The mixture of the bicarbonate and vinegar will clean the inside of your appliance and break up any grease or dirt. You can also complete the cleaning with a sponge around the seal and door. Wipe clean with fresh water. Will a washing machine work after a flood? If the problems with the water leak have been resolved, your water inlet should work as normal and the appliance will work. If the room has been flooded and the appliance has been even partly submerged in water, do not use the appliance until it has been thoroughly checked for damage. Submerged electrical components will be dangerous to use even if they have dried out. This may even cause further problems down the line due to the original flood damage. Will washing machines freeze in the garage? If the water pipes are likely to freeze in an non-insulated garage, then so will your washing machine. It is recommended that you position your appliance in a room with a tolerable ambient temperature, such as the kitchen, utility room or similar. Will washing machines leak if overloaded? Overloading your washing machine will prevent the individual items from washing properly. The water will not be able to penetrate, wash and rinse the laundry, the detergent will not dissolve correctly and the weight of the overloaded drum could cause damage to the appliance. While an overloaded machine will not directly cause a leak from your appliance, the subsequent damage from overloading it could cause problems with the drum and seal that will in turn leak water. Similarly, if you just wash one item and your drum is severely under loaded, the drum may be unbalanced, not spin correctly and again the wash results may prove unsatisfactory. Can washing machines leak oil? If your washing machine is leaking oil, there is probably an issue with the transmission system. This part of the mechanism runs using a belt and clutch assembly and will be lubricated with oil. If there is a pool or drops of oil coming from the machine, this is likely to be where the problem has originated from. Please telephone our engineer line on 01949 862012 to get this problem fixed. How do washing machines eat socks? We have all been there. Trying to pair up our socks after the washing has finished, only to find out that the sock with ‘Monday’ on it now has to go with the one labelled ‘Thursday’. Where do they go? Well, we have the answer. No, it is not just one of life’s phenomena. There is actually a special place where all your odd socks end up once they have divorced and left their matching partners. The culprit is the rubber ring gasket. Ever since the front loading washing machine was invented, the occasional sock has been lost into the abyss. When the door on your washing machine is closed, the gasket forms a seal around the edge to protect from water leakage. If there is even the tiniest hole or gap in the seal, socks can be sucked through during the spin cycle and buried inside the machine at the bottom. If you have had a problem with unexplained sock disappearances, check the gasket for any damage and consider looking behind the front façade of your machine to see if your ex, ex, ex’s gym sock is lurking in there. Will a washing machine kill norovirus? The norovirus is very dangerous because it can survive for months in still water or for weeks on fabrics and hard surfaces. Re-contamination is a real possibility so, as well as washing according to our guidelines, it is important to eliminate all contamination and risk. A hot wash is the best way to remove viruses from your laundry. Wash at 60°C or above. Add chlorine bleach to the wash to kill the virus. Colour safe bleaches will not kill norovirus. Use a hot tumble dryer setting to dry laundry. Do not hang dry. Wash your hands in hot water with soap after handling the laundry. Please note: fabrics may be damaged by hot washing, hot tumble drying and chlorine bleach. Will washing machine water kill plants and grass? We all want to save water and reuse where we can. Grey water, or the waste water from your showers and baths, sinks, dishwashers and washing machines can amount to thousands of litres per week. Grey water may quickly stagnate, causing a health hazard. Dishwasher water in particular is the most likely grey water to damage your plants as it contains fats and food waste. Do not use this waste if members of the household have been ill. The waste water from washing facilities may contain harmful bacteria. Laundry detergent will leave chemicals like phosphorus in the grey waste water. This is actually a component of some fertilisers and can be beneficial to plants in small doses. Too much phosphorus can damage the plants, especially if they have no access to additional clean water. Be aware of groundwater. Do not water with this waste if there is a chance that it could seep into waterways. This could be fatal to wildlife. There may also be high levels of salt in the grey water from your detergent. The sodium in these is detrimental to plants and wildlife. Detergents are alkaline. Without dilution and with prolonged use, the PH of your soil could be dramatically altered. If you want to reuse the grey water, try diluting it and reducing the amount of detergent you are using in the home. Where is the washing machine drain hose? The drain hose is located at the back of the appliance. It is usually grey and connects from your appliance to the waste water outlet. Where is the washing machine belt? The washing machine belt is located inside your appliance, behind the washing machine drum. It is a black rubber belt that runs around both a large and small wheel. You will probably need to undo the fixing screws on the back panel of your appliance to reach this part of the machine’s mechanism. Where are washing machine bearings? The washing machine bearings are located around the central drum of your appliance. There is significant work involved to disconnect wires, remove springs and get to the bearings in the drum. We recommend that this work is only undertaken by a qualified professional. Please telephone our customer care team for advice on 01949 862012. Where is the washing machine lint trap? Your washing machine will have a filter to catch debris from the wash load, stopping it going into your pump or plumbing. If it gets blocked, your machine will hold water and could potentially leak if the problem is not resolved. Of course it is best to check your pockets for tissues, coins and other bits and bobs before you wash your clothes but a regular check and clear out of your filter can also prevent problems from occurring. Open the hatch at the front bottom left or right of your machine and undo the filter cap. Pull out the filter part of the machine. Remove any fluff, debris and pocket any loose change-finders keepers after all! You can also soak the filter if it is particularly dirty. Replace the filter, screw the cap back on and close the hatch door. Where is the washing machine filter? 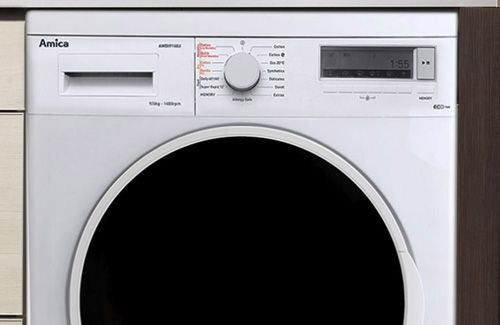 Your washing machine filter should be located at the front of your appliance, at the bottom right or left. Look out for a square or round flap that opens when pushed. Which washing machines have sealed drums? Amica washing machines do not have sealed drums. Sealed drums encase the bearings and other parts inside plastic, making it difficult to repair or replace the different elements. 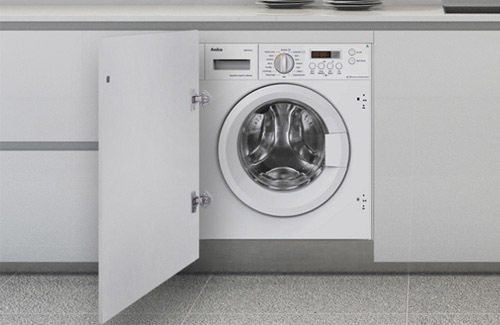 By having non-sealed drums, our washing machines are repairable and accessible to engineers if and when required.